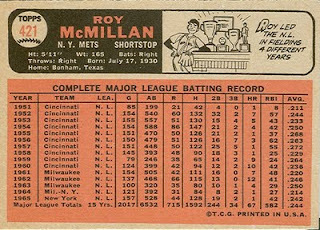 Roy McMillan (#421) began playing pro baseball in 1947. 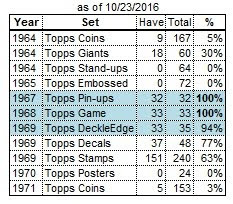 As with many long-time veterans, Topps has omitted McMillan's minor-league stats from the card back. He made his major-league debut in 1951 with the Reds. 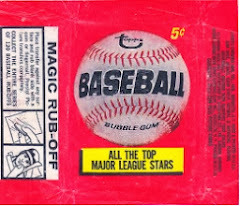 In his first year, he was the backup SS/3B. In 1952, he took over the shortstop position, and was one of two Reds players to play in all 154 games. McMillan continued as the Reds starting shortstop for nine years. A durable player, starting in 1952, he played in 150 or more games in 7 of the next 10 years. After 1960, he was traded to the Braves for pitchers Joey Jay and Juan Pizarro. After 3 years as the Braves regular shortstop, he was traded to the Mets in early 1964 for pitcher Jay Hook. Once again, McMillan was the regular shortstop for the Mets during 1964 and 1965. 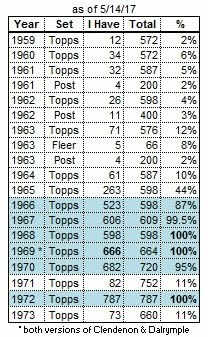 Before the 1966 season, the Mets acquired shortstop Ed Bressoud, and the 2 players shared the shortstop job fairly evenly in 1966. 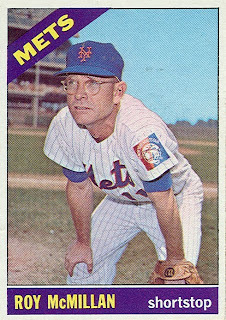 McMillan was released by the Mets following the 1966 season, although his last game was in early August. Roy also managed the Mets during the 2nd half of 1975.